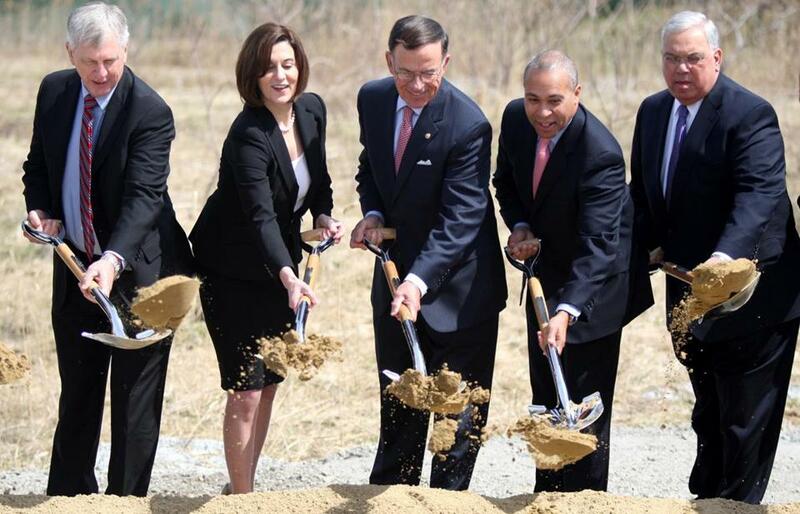 Boston Mayor Thomas M. Menino, far right, at a groundbreaking in Dorchester in 2011. Also pictured are University of Massachusetts President Jack Wilson, Victoria Reggie Kennedy, Paul G. Kirk, and Massachusetts Governor Deval Patrick. As Mayor Thomas M. Menino prepares to leave office, real estate developers are lining up to seek key approvals for billions of dollars’ worth of mega projects before the election of a new mayor, or a blip in the economy, can upend or delay their plans. Over the last three months, the Boston Redevelopment Authority has received 23 large development proposals, a 35 percent increase over the same period last year, officials said. The pitches include a 60-story office tower and residences in Government Center, a pair of towers next to the Christian Science Plaza, and large-scale apartment and hotel projects in Roxbury, East Boston, the Fenway, and the Back Bay. BRA officials said they are not rushing projects through. But they intend to move forward with as many as possible. With a strengthening economy behind them, developers are seizing the opportunity. For them, the transition to a new mayor raises the prospect of considerable delays, due to possible changes in personnel and policy at the BRA that could prolong the permitting process. Most developers are loath to discuss political and permitting considerations publicly, for fear of offending neighbors or City Hall. But David Begelfer, chief executive of an influential real estate association in Boston, said many are clearly uneasy. Developers are eager to get projects launched now, while the city is experiencing a burst of population growth and real estate investment by new residents and businesses. “The city is doing well, and there is capital available to build right now,” said Thomas N. O’Brien, a former BRA director who is pursuing construction of a 60-story office skyscraper and several residential buildings to replace the Government Center Garage. O’Brien said the mayor’s impending departure did not significantly influence the timing of his proposal, filed early last month. But he said it is certainly a consideration for developers, given how quickly the real estate market can turn. A stream of proposals have arrived at City Hall since late March, when Menino announced that he would not seek reelection. Combined, the projects would result in more than $4 billion in private investment to build office towers, a half-dozen hotels, and 5,160 residences. Some projects have already been given the go-ahead. During a meeting last week, the BRA approved construction of more than 1,100 apartments in East Boston, Dorchester, South Boston, and the Fenway, including a 320-unit project called The Point at Boylston Street and Brookline Avenue. Samuels & Associates, the company leading the $185 million project, said it is trying to capitalize on Boston’s strong rental apartment market, not Menino’s impending departure. The firm also recently received approval for a $150 million residential and retail project at the corner of Western Avenue and North Harvard Street in Allston. The concern seems apparent at meetings in City Hall. Last week’s BRA agenda was unusually long, with 37 items and an array of development proposals up for consideration. A recent meeting of the Boston Civic Design Commission ran past 11 p.m., as members reviewed several large proposals across the city. The pace of the city’s review process, and the process itself, could change dramatically after the election, as it did following Menino’s elevation to mayor. In 1994, Menino hired a lawyer from New York City, Marisa Lago, to head the BRA and announced a major restructuring of the city’s economic development agencies. Soon, a quarter of the BRA’s staff was fired. Two years of tumult and inactivity followed, ending with Lago’s departure. But the economy is much stronger than it was when Menino first took office. Meade said Boston is one of the top three real estate markets in the country and has a good opportunity to capitalize on the growth in coming months. “This moment is the culmination of a lot of work over the last 2½ years,” he said.